Welcome to our Ischia blog, Good Morning Ischia! Here you can see the entry for Wednesday 1st January 2014. 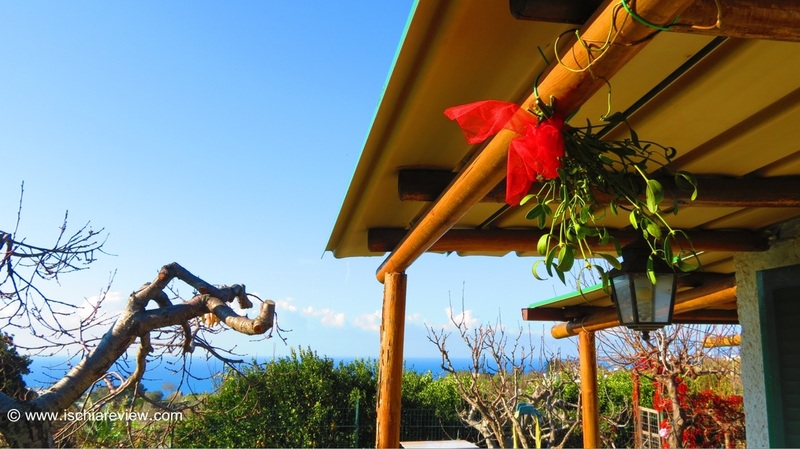 It's a fabulous start to the new year in Ischia. Flinging open the shutters this morning after a slightly over-extended lie-in was like a dream as the warm air and sunshine flooded through the house. The windows remain open as we go into the afternoon and it feels like one of the first days of spring. The outside thermometer which is in the shade is already showing 16° Celcius (61° fahrenheit) which is warmer than the weathermen are telling us it will be. It will no doubt be a bit chilly at night with the clear skies and we expect a minimum of 12°C (53°F). The lovely weather is the perfect antidote to any hangovers that may currently be taking hold after a night of New Year revelry across the island which lasted long into the early hours. As in most countries, Italians celebrate with parties, dancing and various types of bubbly such as Prosecco, Champagne and my new favourite drink, Braghetto which is a type of sparkling rose' wine. Standing outside at midnight last night was a magical experience, the sky was already full of stars before the collective might of the island's firework displays was unleashed simultaneously creating a spectacular show of bright colours that lasted a full fifteen minutes. The fireworks came from every direction as hotels, houses and the towns themselves made their contributions to the spectacle. People everywhere wished each other "auguri" (best wishes) and "buon anno" (Happy New Year) with Italian-style hugs and kisses, (you know the ones that catch us unawares when we go in for a polite handshake only to find ourselves caught up in an unexpected embrace!). Mistletoe ("Vischio" in Italian) also featured heavily at midnight with the kissing tradition as strong here as it is in many English-speaking countries. Today's photo is a small homage to that tradition and was taken this morning, showing a small bunch hanging above our very own doorway. Today is known as "Capodanno" (New Year's Day) in Italy and most people have the day off. Typically the day is spent relaxing with family and of course consuming all sorts of delicious food. As the weather is so nice today there'll be plenty of people taking the chance for a stroll along the beach or around the towns where they can bump into friends and swap stories about last night's events. Anyway, that's all for today, I wish you all once again a Happy New Year and hope that 2014 serves you all well. I'll be back tomorrow morning and hopefully a little earlier than today's slightly tardy effort.